Heat Cable Coverage 160 Sq Ft with 3" Spacing or 213 Sq Ft with 4" Spacing . Cable Length 640 Ft ,10.10 Amps , 2440 Watt , 240 Volt , EasyWire radiant heating element is 1/8" Thickness . EasyWire is designed for heating bathrooms, sunrooms, basement remodeling, or any other place where warming the floor provides greater comfort. EasyWire can be used as a surface warming system for specific zoned floor areas. Floor Heating System EasyWire comes in different heat requirement strengths from 10 to 20 Watt per square foot, depending on the heat requirement of the room. Use 10 Watt per square foot for secondary comfort heating, while the use of 20 Watt per square foot is recommended for primary room heating. Flexible “clip strips” are attached at the edge of the room. The EasyWire is then stretched between the two opposing strip edges at a fixed spacing to create a heating grid. The EasyWire will conform to the shape of any room, going around difficult obstacles while creating a perfect heating grid that is highly economical. The cold leads are 8 feet long, for easy electrical installation. 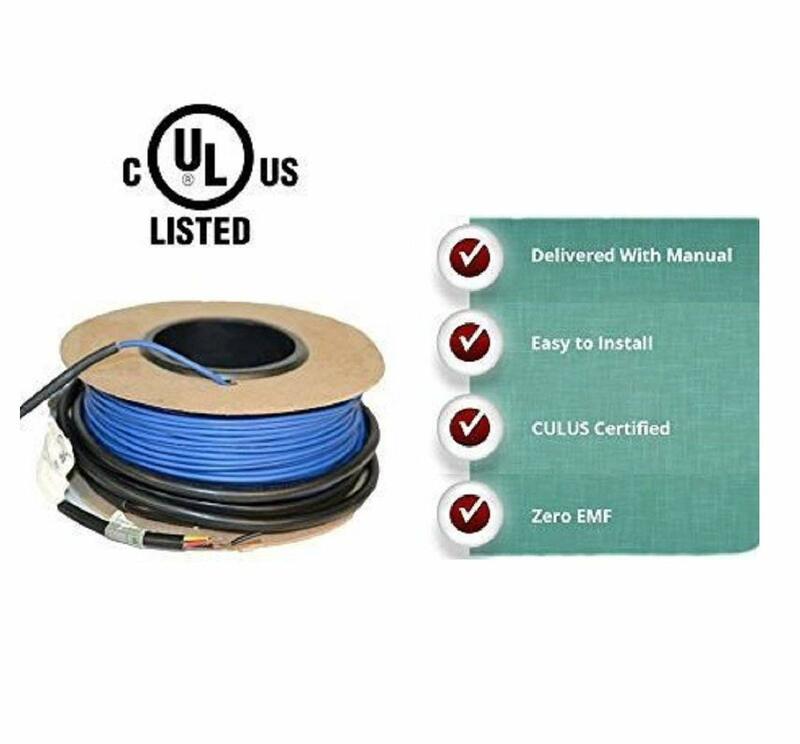 The cold leads are 14AWG copper cable with a double layer of PVC insulation. Rated at 105C Repair kits are offered for accidental damages to the heating element cable during installation. IMPORTANT – DO NOT CUT HEATING ELEMENT CABLE.